A Beautiful Ruckus: Oh Goody! A Box of Goodies! Oh Goody! A Box of Goodies! A house full of toddlers, means a house full of snacks. It just kind of goes with the territory. We keep a lot of crackers, pretzels, and raisins on hand for hungry kids, and Sean likes to hand out pieces of beef jerky when he gets home from work. However, after awhile the novelty of yet another graham cracker starts to wear off. And then there is me. I often sneak a bite or two when doling out snacks to the kids, and I have a tendency to kick back most afternoons after the kids go down for their nap and nibble on a little something. My current favorites are pita chips and microwaved smores. But sometimes I just get bored with my options. I'm the type of person who likes to stick with the tried and true. I rarely experiment with new things because...well, what if I don't like them? Then I'm out whatever money I just plunked down, and I'm faced with a whole bag of something I don't want to swallow. Sean, on the other hand, loves trying new things. Loves it. He likes to shake stuff up because he enjoys all sorts of different items. Unfortunately, sometimes he stops by those little tasting stations at Costco, gets hooked on the one bite they offer him, and buys the entire bag. Then I'm faced with a gigantic bag of a snack I may or may not like. It's thoughtful, but can be a little overkill. Goodies Co. solves both of those problems: new things to try in samples small enough to leave no big bag purchase regret! The sad news is that there is a long wait list to get into the Goodies Co. program. It's a new service and it's highly sought after. 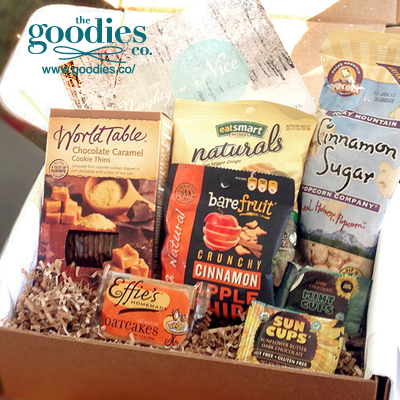 But, I've partnered with Goodies Co. to bring my readers a special code to let them line jump! Hungry toddlers and parents don't have time to be wait listed, am I right? Just click HERE, enter your email address, create a password, and use code "JUNEVIP" to get right in! You'll receive two emails: one will say you've been wait listed, and the second will say that your invitation has arrived. That's how you jump the line and can get in right away! Then you just enter your payment info and goodies will be on the way to your house! There is nothing I hate more than wasting money. I'm glad someone finally came up with a way to let me try snacks without investing a huge amount of money in them! Curious what all comes in the boxes? Click HERE for what the past few boxes have contained. The value is incredible! The last one had the shelf stable snacks plus a bonus coupon for a free Wholly Guacamole product! I think that's what snagged me right there. 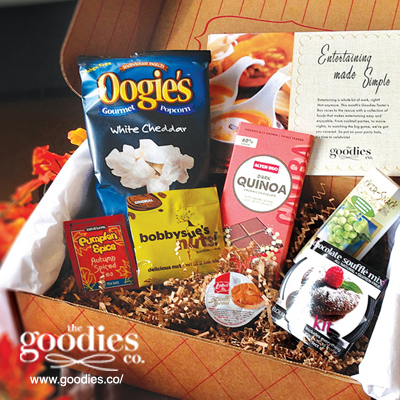 See what else the boxes contain, and then start your own snacking adventure! This post is sponsored by Walmart Labs. For more info, please see my disclaimer page. Thanks for sharing this. I've signed up--81 years old and live alone. I thought what a fun surprise each month! I'm thinking of ordering it for a few of my friends' birthday gifts. Something new and different!! It sounds like it might be the perfect mix for your family! ooh yeah a free holy guacamole coupon would have been worth it! WhooHoo - I just subscribed. Looking forward to my first box. You better hide it when it comes or you will be fighting the triplets for it!